New to the forum and I just purchased my first ltz 400 it’s a 2009. I tried to load it into my truck and the rear is too wide and after measuring it compares to my buddies 2013 mine is 5ish inches wider and the axle seems to be aftermarket and maybe adjustable. One side looks like it has a spacer/sleeve and one side it seems to be missing and has exploded threads. 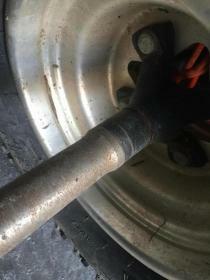 My question is has anyone seen a axle like this or know how to adjust it? Thanks in advance. Crappy pics, but anyway, you adjust it by taking the hub off and and moving the spacers from inside the hub, to the outside. Pictures look good on my phone it resized them to post. Anyways the shaft isn’t splined so the hud will slide it’s threaded like a bolt. 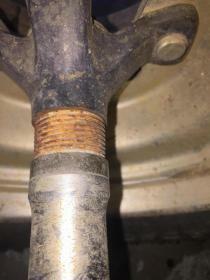 If you look at the first picture the rusty area are threads Not spline. I haven’t been able to find a axle like it online. Never even heard of one like that. Looks like my Tusk axle, but it has splines under the spacer. Once the spacer is removed, the hub slides on further and the spacer goes on afterward, allowing you to move the hubs in further if you want. I guess I just need to pull it all apart and see what’s going on because I also have never seen one like this they all have splines. I guess I don;t understand. Your hubs thread on? That’s what I’m asking if anyone has seen a axle with threads vs splines. I haven’t pulled the hub off yet but it looks like the threads go into the axle housing and also into the hub. I’m going to try and get it pulled apart tonight and see what it looks like with the hub off. All Axles have threads to hold the hub on to the axle, after you will see the hubs have splines to match the axle splines. the spacers are just spacers nothing fancy there. Just take the nut off and see for yourself. If you dont wantthe quad that wide put all the spacers on the outside so move the hub closer to the middle. Axle looks like any number of aftermarket brands like Durablue, RPM, Tusk. Last edited by tylerltz400; 04-11-2019 at 11:58 AM. I understand the axle is threaded for the axle nut but on this axle the threads are on the inside of the hub and they go into the axle there are no splines at all almost like the way you adjust the axle is by turning the threads into the axle itself after removing the spacer. That’s an odd setup. So, when you hit the throttle, it just torques the crap out of the hub for you on one side and loosens the other? Who would design such a thing. I seriously need pics of that insanity! I have taken it out 3-4 times and it hasn’t moved but there is suppose to be a spacer. It’s a crazy setup in my eyes too that’s why I’m asking lol. Might just need to order one with splines. Yeah, I’d replace that axle and the hubs. Looks terribly corroded as it is. Much abuse would probably smoke those threads anyway. Also OP if your hub was threaded the whole way and someone only put the hub on part way with the spacer missing there is no way it would stay tight. 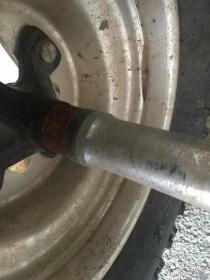 That is why its a spacer and your axle is a standard design. Get a big A$$ hammer and get to work. Last edited by tylerltz400; 04-12-2019 at 12:05 PM.